After being on this natural hair journey for four years, I have had my fair share of using different maintenance and styling tools. There are a lot of naturals who only use their fingers when handling their coils, but I am completely out of patience for that. I have tried numerous ways to detangle, section, dry, and sleep with my hair and here are the five tools I swear by that make my hair extremely low maintenance. This is the best comb I have ever used. It has double rows of teeth to eliminate difficult knots and prevent curls from springing back and re-tangling. The teeth are long to reach through the densest of curls. It also allows for fewer combing strokes so curls remain defined and frizz-free. With this comb I do not worry about the teeth breaking over time. First I run a little water over my hair, coat it with a slippery daily conditioner, and then detangle starting from the ends and working up to the roots. 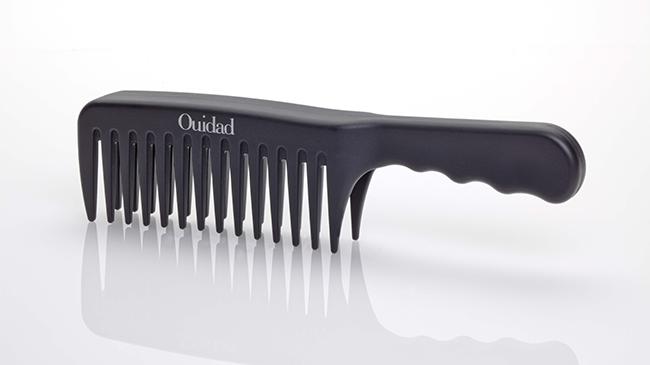 When comparing this to a shower comb or detangling comb, the Ouidad Detangling Comb gives the least amount of breakage and allows me to create the largest sections. On wash day I used to grab whatever was accessible to section my hair and as a results I experienced breakage because of it. Whether it is the Goody ouchless elastics, prong clips, or bobby pins, they all either snagged my hair, flew off, or rusted over time. One day while in Sally Beauty, I stumbled on The Croc Clip. I was extremely hesitant about spending $8.99 for a pack of four hair clips but I figured I would give them a try. Sure enough they were worth the money. 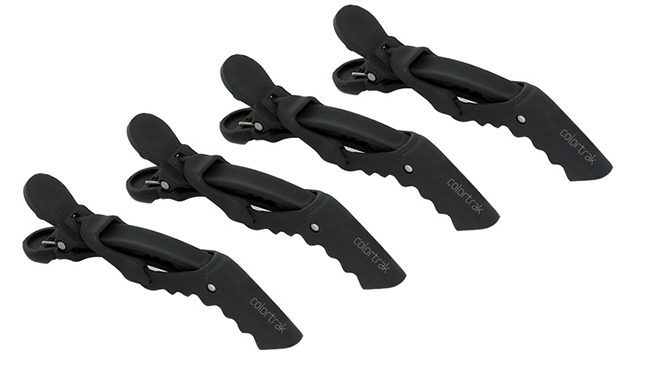 These unique double-hinged clips hold large amounts of hair and have a rubber finish to ensure no slipping while working with wet hair. They can be used for coloring, cutting, and styling. These clips do not pop off, rust, snap my strands, or pull my roots, so if you have dense, coily hair then I highly recommend purchasing these sectioning clips. If you want to up your deep conditioning, then using a plastic processing cap is a must. If you don’t want to purchase one, then the produce bags or checkout bags at the grocery store will suffice. Simply use this to cover your hair while you pre-poo or deep conditioner for 15 min. Being able to trap your body heat can help some of the ingredients in your deep conditioner to adsorb to your hair’s cuticle, leaving your strands feeling supple. Any time I have attempted to deep condition without one my hair never feels as soft and moisturized, so no matter where I am, I always manage to find a plastic cap to deep condition my parched strands. By now most women with textured hair know that sleeping on a cotton pillowcase will withdraw moisture from your hair, but when it comes to style preservation I realized that this pairing of a satin scarf and bonnet helps to maintain my wash and go. After using a satin scarf to secure my hair in a modified pineapple, I cover my ends with a satin bonnet. This protect my ends that are protruding from the pineapple while also helping to create a round shape for when I release it in the morning. Only using a satin bonnet causes my hair to matt and so does solely relying on a satin pillowcase. 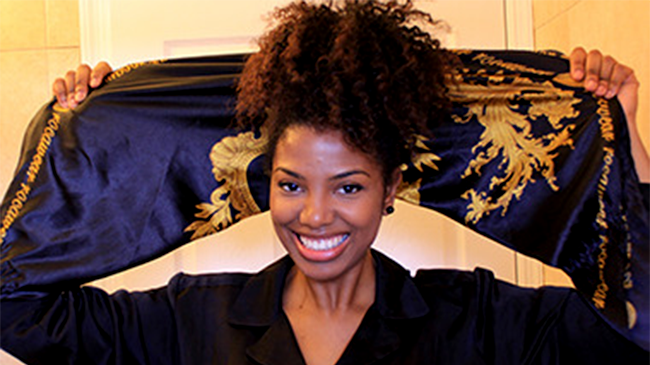 Consider using a satin scarf and a satin bonnet together to preserve your wash and go’s. Which curly girl tools can you not live without?